The I.V. 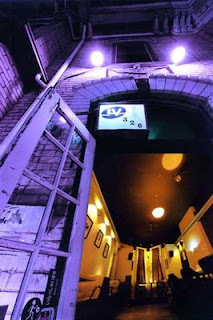 Lounge on Dundas Street (seen here in a manipulated image created by Steve Venright for the cover the anthology The I.V. Lounge Reader) is closing its doors for good starting tomorrow. As many people know, this is the place where I started, with the help of Peter Darbyshire, the I.V. 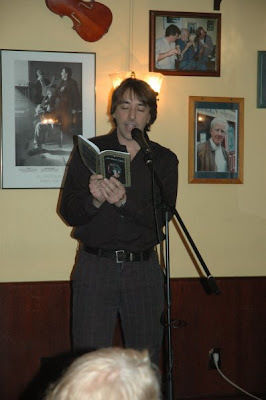 Lounge Reading Series in 1998. I ran the series for five years, and Alex Boyd has been running the series since 2003. Now, the reading series is kaput, though I guess we can be proud of a strong ten-year run. ...there’s one more opportunity to have a drink at the I.V. Lounge, say thanks to Kevin and chill out there, and that will be Sunday night, Aug 24 anytime after 3pm. After that, the bar is closed. It also happens to be Kevin’s birthday, so feel free to wish him a happy one, aside from wishing him luck. I suspect I’ll be there sometime after 8pm, and hope to see a few of you. For the rest of Alex's message, click here. For a few memories of the old days when I ran the series, Google Books has some pages from the The I.V. Lounge Reader available to view online. The selection includes my introduction to the anthology, poems by David McGimspey, George Bowering, Jennifer LoveGrove, and A.F. Moritz, and fiction by Derek McCormack, Tamas Dobozy, and an otherwise unpublished short story by Andrew Pyper in which he coins the word "sockfarty" which is probably one of my all time favourite Canadian neologisms. You can read it all by clicking here. This is bizarre. Brantford, Ontario, Poet Laureate John B. Lee is among those targeted by an email phishing scam that seeks to exploit the fragile egos of poets, asking them to fork over a "handling fee" of 1,555 Euros to process their nomination for the newly international Pulitzer Prize. In fact, the Pulitzer Prize is still only open to American citizens, so Canadians needn't worry themselves about it. Lee admits he had "a sliver of hope," but quickly realized the email was bogus. So far, it doesn't seem this scam has been successful, as no one has handed over the fee. The phishing here is laughably obvious. The Pulitzer Prize wouldn't ask nominees for money, let alone in Euros. As crime goes, this one belongs in the Stupid Criminal Files. This story was reported by the Brantford Expositor. Read about it here. Jason Camlot, seen here reading from his latest book The Debaucher, is the Chosen One. It seems like everyone is chosing Jason Camlot, and now he has been chosen by David Lehman for inclusion on The Best American Poetry blog. Camlot's poem "Since I have stuck my toungue..." -- a reworking of a poem by Victor Hugo -- is the first of several poems by Camlot selected for the online companion to the popular book series. * Honestly. Check out the comments on Lehman's blog. I took this picture of Stuart Ross (left) and Jason Camlot (with Stuart's camera) during a trip to Buffalo back in May. You can see my reflection in the window, and you can also see a strange little doll that could be one of the lost boys from Peter Pan. Stuart and Jason were there to promote their new books, Camlot's The Debaucher and Ross's Dead Cars in Managua, and I was just tagging along for support. Evie: At the Punchy/Insomniac launch in Toronto, the crowd was vocal and enthusiastic during your reading. Afterwards I heard many people talking about the artwork - the cover as well as the photographs of the cars inside. How did you decide on your cover art, and can you give some of the back story about the cars? As far as I'm concerned, Selima Hill has not been allotted the full measure of public acclaim that she deserves. Perhaps she has been taken for granted -- the hard-working poet who can always be relied upon to produce engaging work, she needn't be distracted with too much praise! Or perhaps because her poetry is so inwardly potent, so complex in its evocative power and yet so crystalline, so seemingly simple in its execution, that some critics and academics have neglected to tout the excellence of her work because it doesn't flatter their own. Readers in Canada have another reason for not knowing much about Hill's poetry. Her books are published by the marvellous Bloodaxe Books, one of the English-speaking world's best poetry publishers, but Bloodaxe books do not have a Canadian distributor (though they can be found on Amazon.ca), so they are seldom found by Canadian poetry readers who enjoy browsing in their local independent bookseller's shop. The tall giraffes can never sit. Their names are Valerie and Gwendoline. I am their tall reticulated son. This is our sand and hay. blonde swallow-tails, hares, a little milk. you are in love with someone else, not him. Perhaps, now that readers have the opportunity to not only read her latest work, but also to catch up on the best of her output to date, she may finally come into the attention she very richly deserves. To help her along, I've gathered together a few resources from the internet for those who are interested in knowing more about this remarkable poet and her work. If Gloria's generous 330-odd pages demonstrate how substantial Hill's body of work is, The Hat shows this brilliant lyricist of human darkness writing more acutely than ever. So original that it has sometimes scared off critical scrutineers, her work must now, surely, be acknowledged as being of central importance in British poetry - not only for the courage of its subject matter but also for the lucid compression of its poetics. The British Council offers sound recordings of five Selima Hill poems here. The poems included are "Being a Wife", "My Sister's Poodle is Accused of Eating the Housekeeping Monkey", "The World's Entire Wasp Population", "Why I Left You", and "Your Girlfriend's Thigh." Order Gloria in Canada, the USA, and the UK. Order The Hat in Canada, the USA, and the UK. A high school student named Sarah Davis (aka hamstergirl7) made a video for my poem "The Days Dogs Die" as an assignment for her English class. She has posted it on YouTube, and (with her permission) I'd like to share it with you. Thanks, Sarah. Good news! The excellent documentary series Visions & Voices is now available online in streaming video thanks to www.learner.org My first experience with this series was the marvellously engaging documentary about Robert Lowell that I borrowed from a friend who owned a copy on VHS. You can watch a sample clip of Lowell reading his spectacular poem "My Last Afternoon with Uncle Devereux Winslow" here. Aside from Lowell, the series also includes documentaries about Elizabeth Bishop, Hart Crane, Emily Dickinson, T.S. Eliot, Robert Frost, Langston Hughes, Marianne Moore, Sylvia Plath, Ezra Pound, Wallace Stevens, Walt Whitman, and William Carlos Williams. I've already watched a few of these, and I'm looking forward to watching the rest. A video instructional series on American poetry for college and high school classrooms and adult learners; 13 one-hour video programs and coordinated books; also available on CD-ROM. The lives and works of 13 renowned American poets are interpreted through dramatic readings, archival photographs, dance, performances, and interviews in this inspiring series. Illustrative poems in each program are accompanied by insights into their historical and cultural connections. The series covers the terminology of poetry and the larger role of poets in American and world literature studies. Poets include Langston Hughes, Robert Frost, Emily Dickinson, and Elizabeth Bishop. To watch the streaming video-on-demand, you have to register with the site, but it only takes a few seconds to do that. To get started, just visit this website, and soon you'll be enjoying the programs. If you prefer to buy the series on DVD, you can do that here. I've got about 1,200 single-author poetry books, not including chapbooks. What I'm going to do here is go through them all and read them, one each day or so, and write about them. Thereby learning how to write about poetry books. And thereby deciding which ones to get rid of, because I'm drowning in books. Oh, also I'll presumably find hundreds of great poems I haven't read before, because I've only read a fraction of the collection. Tomorrow, I'll read an author whose last name starts with A. On Saturday one whose last name starts with B. And so on. I'll keep cycling through the alphabet, until I've read and written about all my goddamn poetry books. Or maybe I'll give up after Day 4. We'll soon find out. And here is where you can find Stuart Ross's new blog. And here is Bloggamooga, Stuart Ross's general blog about other blogworthy things not related to the aforementioned blog. It's worth dropping in from time to time to see what Ross is up to.